Elijah Glenn Swafford was God’s idea from the very beginning. We always wanted a house full of children, but after much reproductive assistance with our first two children, we had made the decision not to actively pursue another pregnancy with reproductive interventions. No permanent measures had been taken to prevent a future pregnancy. We just put it totally in God's hands. And then He decided to surprise us. I began displaying some signs of pregnancy but mistook them for symptoms of gallstones! Finally, the symptoms were such that I was lying in my bed and became overtaken with the thought, “Am I pregnant?” To our shock, the pregnancy test was positive, and I was already about 10 weeks along. I did not even have a doctor, for we had moved to another state immediately following the birth of our second child. We quickly did extensive research and got in to see a fabulous doctor in our area. The first appointment was not until I was 12 weeks. Our doctor did an ultrasound and our family of four got to see a first glimpse of that precious heartbeat of family member #5. We also found out that we had been pregnant with twins. Baby "B's" heartbeat had recently ceased. There were mixed emotions in every way. Melvin and I were shocked that we were even pregnant. I was still experiencing the sickness of a pregnancy of twins because Baby "B" was not "absorbed" completely yet, so there was a constant reminder of the loss until the intense naseau started lifting a little. Our children were elated! There have never been two children more excited about having a baby brother or sister. Not a day went by that they did not talk to “baby” and pray over him and me. The extensive ultrasound was scheduled for around 24 weeks. Ultrasounds are always an apprehensive event for us. Most people go with such a naivety, just thinking that the only thing that matters on that day is boy or girl, but the doctor is looking for so much more. It has always been thrilling to see the brain, spinal cord, and the four functioning chambers of the heart. When the appointment came around, our family of four went to catch a glimpse of the new addition to our family. There were no preferences, boy or girl, as far as we were concerned, just a healthy baby. The ultrasound revealed BABY BOY beyond a shadow of a doubt! Daddy and Josiah were ecstatic that they would be able to out vote the girls very soon! The pregnancy progressed with no further problems except for the major nausea continuing until about 24 weeks. At 32 weeks, I had made a trip to the hospital to be monitored because of what I thought were contractions. After being monitored for several hours, I was sent home to rest, as much as possible with a 2 and 4 year old, and drink lots of fluids due to an “irritated uterus”. Week 37 approached quickly with anticipation growing every moment. Our household was in the final stages of preparation for child number three. Our church family had gotten in on the major excitement and thrown us a huge shower at the end of week 36. We had sold “everything baby” at our home, even the bed, just a few weeks prior to our discovering that we had conceived. April 21, 2007, week 37 day 4, will be remembered as a day that changed us.....forever. It was one of those magical family days for us, a day when daddy gets to be home all day, the children obey, and we get to spend quality time together. Finishing touches were made on the room, and Melvin grilled a celebration dinner for us with all of our favorite things. I had awakened that morning with my lower back aching and had started feeling some mild yet consistent contractions around lunch time. No amount of resting or water stopped there coming. So, I called the answering service at my doctor's office around 7 p.m. when the contractions got so that they made me have to lay down to get through them. I had not yet packed a personal bag for the hospital because my cervix had been “Fort Knox” on the previous two births resulting in two c-sections. I was scheduled for a repeat c-section with baby #3 on May 2, 2007 and had packed a baby boy bag during the course of the day’s events. When our childcare relief arrived around 8 p.m., we dashed off to the hospital with only a bag for the baby and the bag with the cameras. The excitement between Melvin and I was growing as we drove to the hospital. Maybe just maybe this would be the night when our #3 miracle arrived! All the way there and up the elevator, as I tried to make it through contractions, Melvin was singing the song “Days of Elijah”. After much prayer, God had told us to name baby boy, Elijah Glenn. Elijah means “the Lord is my God” and he was one of the mighty prophets of God in the Old Testament. Glenn is a family name, my paternal grandfather's name. He passed away suddenly the year before I was born at 44 years old. This name was chosen to honor him and more than that, my daddy. We had kept the name a secret from everyone, so there was a great anticipation surrounding his name as well. Our first stop was Labor and Delivery nurses’ station. They immediately placed us in Labor and Delivery room #1. The nurse instructed me to change into a hospital gown. The first thing that the nurse wanted to do was to hook me up to the monitor and see exactly what was going on with me. The baby’s heartbeat had to be located. She put the doppler on me and there was an eerie silence. She began moving the instrument around asking us where the “sweet spot” had normally been, but the silence was filling the room like I had never experienced before. I immediately began to weep because this was not normal for Elijah or any of my children for that matter. He had definitely been the most active of the children, keeping me awake most all night every night. His heartbeat could always faintly be heard anywhere they had put the doppler. The nurse informed us that she would need to go and get the ultrasound machine so that she could get a more precise location of the baby. I began to utter a one line prayer over and over. “We trust you God......We trust you God....We trust you God....” The sweet nurse on duty that night whisked the ultrasound machine in the room and immediately put the wand precisely on what had been the beautiful pumping four chambered heart of earlier ultrasounds, rapidly pumping oxygen rich blood to our growing baby, but this time the heart was still. She frantically moved the wand off the heart as if she were still looking, but Melvin and I both immediately knew. The heartbeat was gone! The nurse asked if she could step next door and get the doctor that was on the floor to come in and take a further look and give my doctor a call as well. We of course said yes but were already well aware that the hopes and dreams of all the joy that Elijah would bring to our home was in an instant gone. The doctor came in and confirmed the nurse’s findings and our greatest nightmare! She began to tell us that there was nothing we could have done to make the outcome different, and that most of the time, a concluding fault is never found. She continued talking and I was looking at her and could see her lips moving, but do not know what she said. How has this happened? Why to me? I had taken such good care of myself, eaten right, taken my vitamins, exercised, rested, no smoking or drinking, etc.,. I began to focus back in when she informed us that my doctor would come in the morning and perform the c-section, but for now, they would give me something to stop the contractions and help me sleep. What? Have a c-section without the joyous outcome? Within just a few minutes of the staff leaving our room for the information to sink in, my OB doctor came in to do another ultrasound and love on us even though he was not on call and had been out on a date with his wife. We were so thankful that we had done so much research and had even switched OB’s to one that we loved, respected, and trusted, still realizing that he was only a tool in the hands of God. He was so attentive and sensitive to our needs. That night, after my medications had been administered, I went to sleep while Melvin was left to the horrendous duty of calling our family, closest friends, and church family to let them know what had happened to our much anticipated dream - stillbirth. I remember very vividly waking up several times throughout the night and seeing him staring at me with tears streaming down his face. He would jump up from his sitting position and ask me what I needed. Words cannot express the deep love that I have for my sweet husband. He was so tender to me yet still such a rock. To see him hurt so badly over the loss of our son was almost more than I could bear. What a blessing to have such a husband that loves me as Christ loved the church! The next morning was an absolute blur for me. I hardly remember my precious family and dearest friends arriving at the hospital, but I remember with vivid detail the Operating Room and the delivery of our “visitor from heaven”. There is no way to describe the feelings of the room during a stillbirth....no excitement.....no anticipation....no talking.....There was only that eerie silence once again. All of the staff at Crestwood Medical Center that day were working their hardest to make me as comfortable as possible. Our doctor only made phrase statements about the progress of the surgery. 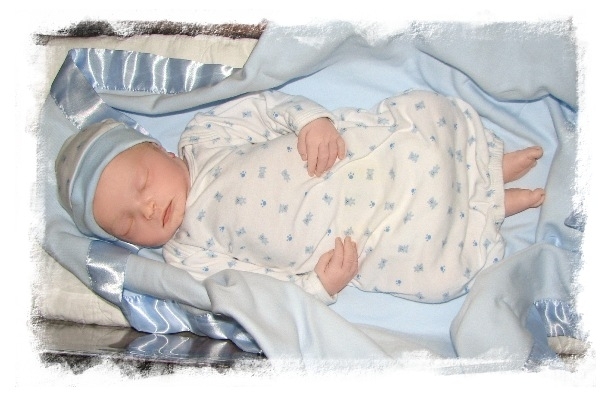 .....The baby is out..... April 22, 2007 at 9:27 a.m. Elijah Glenn Swafford 8 lbs and 21 inches. Little did we know that Elijah would be an eternity child, that he had eternity written by his name from the foundation of the world. “All the days ordained for me were written in your book before one of them came to be.” Psalm 139:16. Never would he have to face the struggles of this world, but never would we get to see the light of his beautiful eyes, the thrill of his beautiful smile, or the joy of hearing him say “momma” or “daddy”, at least on this side of heaven. The nurses took him from the doctor, wiped him up a bit, and gave him to daddy. Melvin held him for one whole hour right above my head as the staff had the tedious job of closing me up. At one point, the nurses asked Melvin if he wanted them to take him. He has since told me that his arm was aching so bad from holding Elijah, but he wanted that ache to mark him for life. He kissed him delicately over and over just like he kisses our other two children while they sleep and tried to take in every detail possible. After the surgery was completed, the nurses wheeled me to the recovery room and asked if I was ready to hold Elijah. I felt like my body robbed and cheated me of savoring Elijah because of the major surgery it had just faced. I was barely able to hold with my arms and observe with my eyes the child that I would for my whole life long to hold and see. I tried to take in every detail but was fading in and out once again. Melvin left me in the recovery room holding Elijah while he went out to get our children and try to find the utterances of a desperate, hurting father to tell them that their eagerly anticipated and long awaited hope and dream of a baby brother was gone. Grace is the only word that can describe this whole day. We were constantly approaching the throne of grace, so that we could receive mercy and find grace to help us in our time of need (Hebrews 4:16) and had intercessors beyond our ability to comprehend approaching the throne of grace for us as well. After our children saw Elijah and were able to touch him, our family and closest friends got to come in and hold him. Probably the thing that sticks out most in my fading in and out was looking over and seeing my mother rock him, telling him who she was, and singing a lullaby to him. After everyone that wanted to got to hold him, the nurses said that this would be a good time for them to take him and do footprints, bathe him, clothe him, and transition me to the postpartum floor. 1 Corinthians 15:55-57. We knew that it was time to say goodbye. His little body had deteriorated so much, especially after the bath. Melvin suggested that some pictures be taken and then for us to have a few moments with him and say goodbye. Goodbye for now! There are no words to describe the feelings of being on a postpartum floor with no baby or leaving the hospital without a baby. The only word that comes to me is empty. If it were not for the love and support of our closest friends and family, by their presence and prayers, we just would not have made it those first few days. God provided just what we needed. As a matter of fact, He has provided exactly what we have needed in every day that has followed. There have been so many people that have obeyed the Lord and touched us in ways that we needed at that very moment. Melvin and I have the fingerprints of God covering every facet of our lives. He has used His body, the church, to minister to us in every way imaginable. Crawling up in our Heavenly Father’s lap each day to worship and read His Word has sustained us. The God of the Word has and is healing us daily as it His truth washes over us. 1 Peter has been a touchstone for us because it is a book in the living Word of God that speaks about dealing with struggles. More specifically, 1 Peter 5 is a chapter I am standing on daily. I must humble myself under the mighty, Sovereign hand of God so that He will lift me up in due time, casting ALL my anxiety upon Him. He cares deeply for me! I must daily walk in firm faith, knowing with an alert mind that I have an enemy, Satan, that desires to destroy me. “After you have suffered for a little while, the God of ALL grace, who called you to His eternal glory in Christ, will Himself perfect, confirm, strengthen, and establish you.” 1 Peter 5:10.